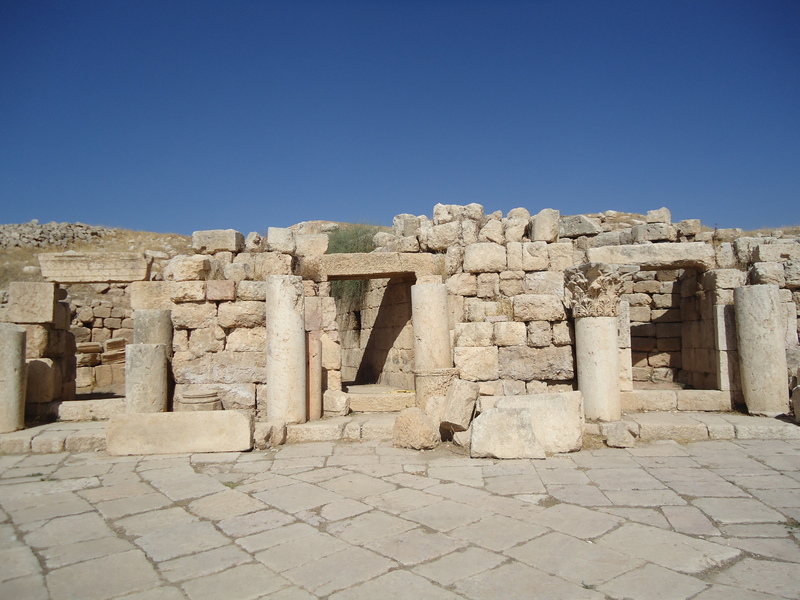 In October and November 2013, project member Solinda Kamani visited Jordan as part of her PhD research into everyday architectural decoration in Late Antiquity. The visit provided Solinda the opportunity to make good use of the library at the Council for British Research in the Levant (CBRL), located in the capital Amman. Here she was able to check the published records of excavations that had been conducted in various Levantine cities to collate data on architectural decoration. Specifically, Solinda is looking for evidence that exists for the embellishment of porticoes in colonnaded streets, shops, modest houses and churches in Late Antiquity. 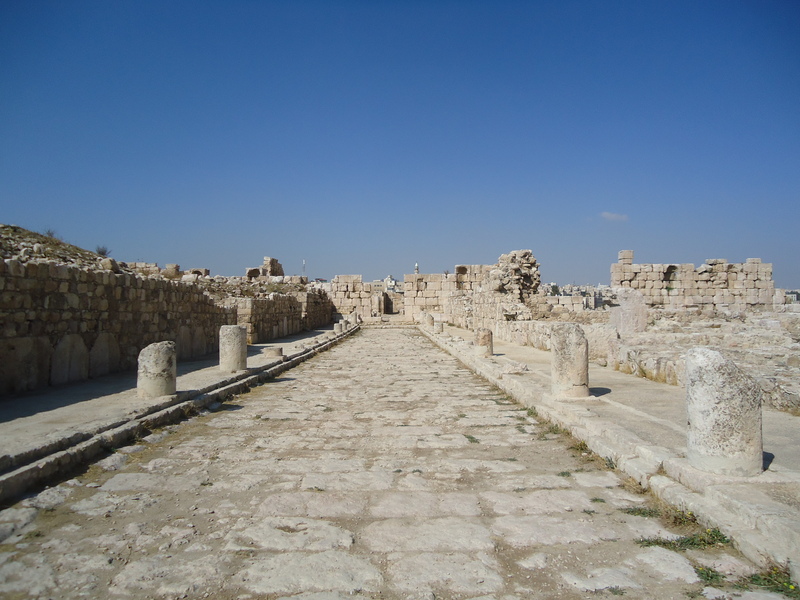 The research trip to Jordan also gave Solinda the chance to visit some of the major late antique archaeological sites in the country, including the settlements of Gerasa, Madaba, Gadara, Pella and Abila. These visits gave a rare opportunity to appreciate first-hand the remains of different types of decoration in their architectural setting. Detail from the floor mosaic in the nave of the Martyrs’ Church, Madaba, Jordan. A key part of Solinda’s research is investigating the way in which different architectural decoration would change over time. 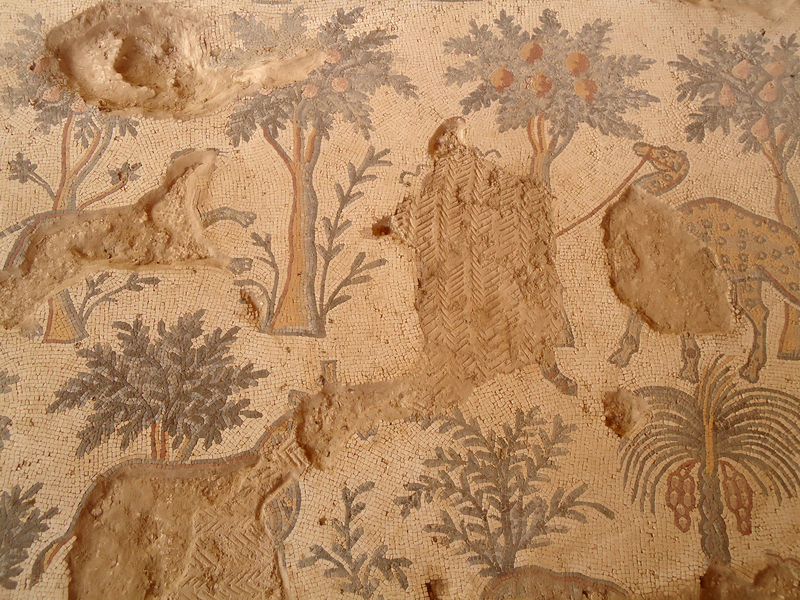 Trips to sites such as Madaba allowed the effects of weathering and human degradation to be identified on architectural surfaces. This reminds us that whilst buildings in late antique cities were like nowadays erected anew, the surfaces and decoration of buildings suffered ageing over time and received repairs that changed their appearance. Shops in the Tetrakionion Plaza, Gerasa, Jordan. It is this kind of knowledge that allows for the more realistic reconstruction of Eastern Mediterranean cities in the fourth to sixth centuries AD. Research such as Solinda’s is passed to Will, the project illustrator, so that he can use it to inform his scenes of everyday life. To see the latest images of Will’s work in progress, visit the Gallery pages of the website.